Pollution saturated rising seas trigger unforeseen events. Mutations are underway. The earth buckles and the ocean warps. Lost cargo is suddenly combustible. 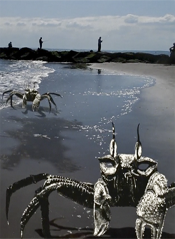 A lethal chain reaction is set in motion and giant carbon crabs emerge from the ocean.